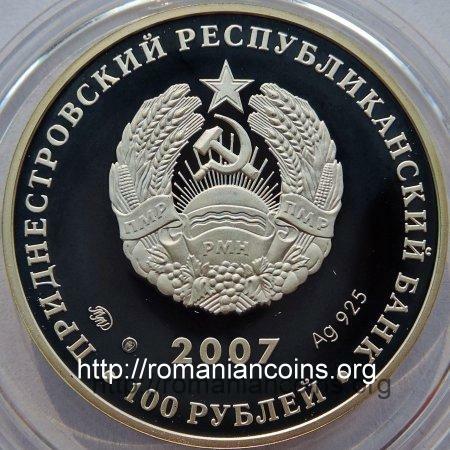 Obverse: denomination "100 RUBLEI" (Cyrillic), coat of arms of the self proclaimed republic of Transnistria (bearing hammer and sickle), inscription "PRIDNESTROVSKII RESPUBLIKANSKII BANK" (in Cyrillic and Russian) meaning "[TRANS] NISTRIAN REPUBLICAN BANK", year 2007, at left mintmarks, at right Ag 925, the silver fineness Reverse: a picture of the field marshal, next the coat of arms of the Russian Empire and, on a sheet of paper, inscription "VOZVRAT RUSSKIH ZEMLI MEJDU IUJNÎM BUGOM I DNESTROM" meaning "RETURN OF RUSSIAN LANDS BETWEEN SOUTHERN BUG AND DNIESTER", inscription "GENERAL-FELDMARSHAL POTEMKYN-TAVRICESKY G.A. 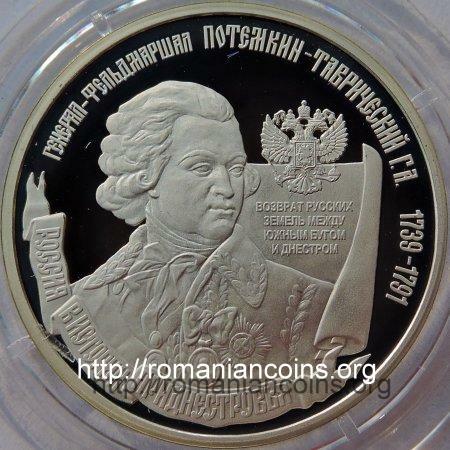 ", years 1739-1791 and, on a ribbon, "ROSSIYA V ISTORII PRIDNESTROVYA", meaning "COUNT RUMYANTSEV-ZADUNAISKY" and "RUSSIA IN THE HISTORY OF (TRANS)NISTRIA"
The coin belongs to a series named "Russia in the history of (Trans)Nistria". The series also comprises the 100 rubles 2007 coins with field marshal Pyotr Rumyantsev and with general in chief Piotr Panin, the 100 rubles 2008 coin with field marshal Peter Wittgenstein and a 5 rubles coin from 2009 with Russian Empress Catherine II. Prince Grigory Aleksandrovich Potyomkin-Tavrichesky (1725 - 1796) was field marshal of the Russian army, statesman and diplomat, being favorite of the empress Catherine II of Russia. In 1783 he conquered and annexed Crimea to the Russian Empire, and he received the surname Tavricesky, meaning "from Taurida", Taurica, Taurida and Tauric Chersonese being ancient names of Crimea. During the Russo-Turkish War from 1787–1792 Potyomkin commanded the Russian army. The name of the marshal is famous in Romania, due to the uprising of 1905 of the mariners from the battleship Potemkin from the Russian Black Sea fleet. In few days after the revolt the Potyomkin's crew surrendered to the Romanian authorities of Constanţa harbor. The ship was returned to Russia and the Russian seamen received asylum in Romania.